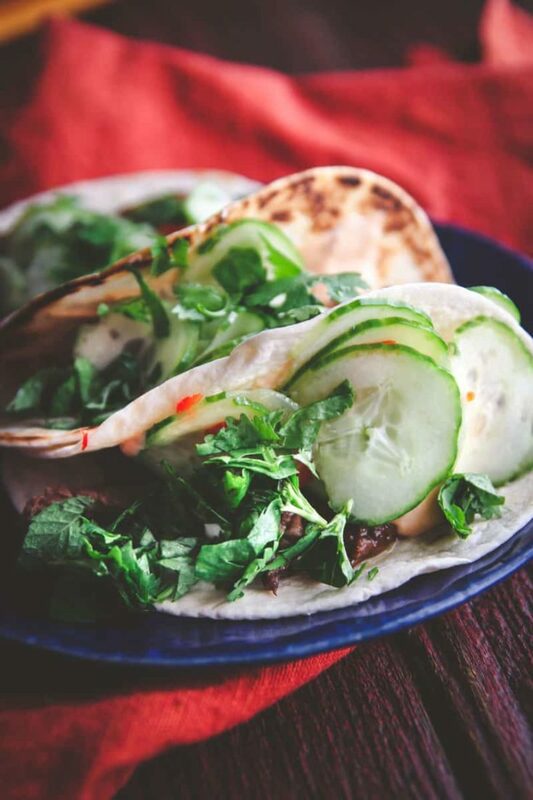 Take your taco Tuesday to the next level with these incredible Korean beef BBQ tacos with quick pickled cucumbers, they’re so good you’re going to want to put them on the weekly rotation. I had one lone cucumber that needed to get used. I was also craving tacos (always am) and remembered I’d once had a Korean BBQ taco that had cucumbers on it and thought that would be perfect! 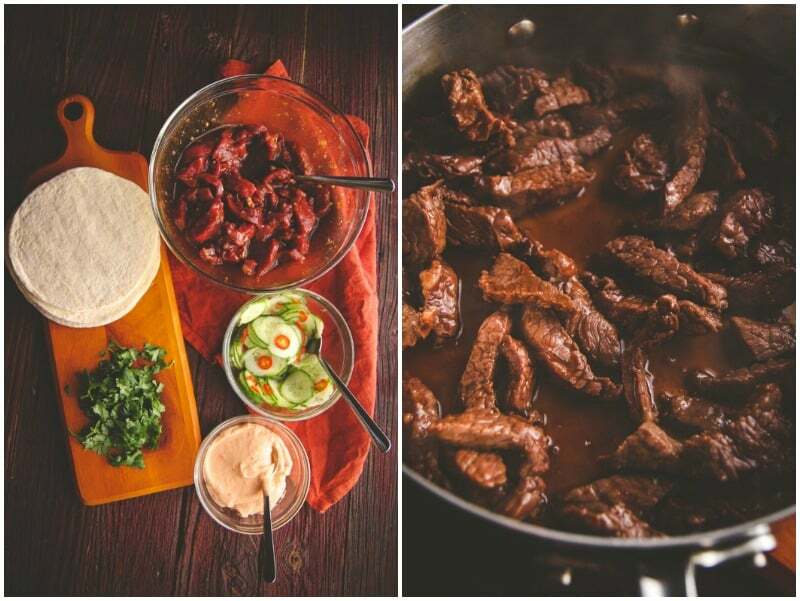 So I googled far and wide and could not find a recipe for Korean beef BBQ tacos that didn’t require a slow cooker or hours and hours of time- maybe I was googling the wrong thing? Who knows. I just threw my hands in the air and said a mental “F-it” and decided to wing it, and I gotta tell you – these were some of the tastiest tacos ever!! Normally I’m not one for dishes that have a ton of ingredients – there are a few exceptions to that rule: tacos (like these slow roasted chicken tacos with radish and avocado slaw) or that time I made those ahi tuna poke bowls (here). I did not mind one bit that this dish required three bowls, multiple spoons, and ingredients galore, because the flavors come together like whoa. The beef is marinated and cooked in a slightly sweet, tangy sauce. The cucumbers are quick pickled and provide a nice crunch, and these are truly quick pickled, they’re ready in 30 minutes, and then there’s a spicy mayo sauce that ties it all together and then the tacos are topped with fresh cilantro. Bite after bite of deliciousness!! I’m kind of obsessed with this recipe. 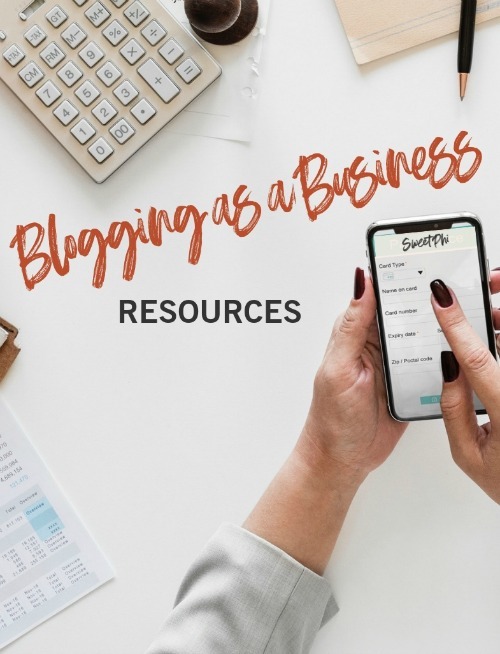 There’s normally more of a lag time between when I make a recipe and when it actually sees the light of day on the blog, but with this recipe…I made it on Thursday, and then again on Friday, and I’m making it again this week…you get the point. 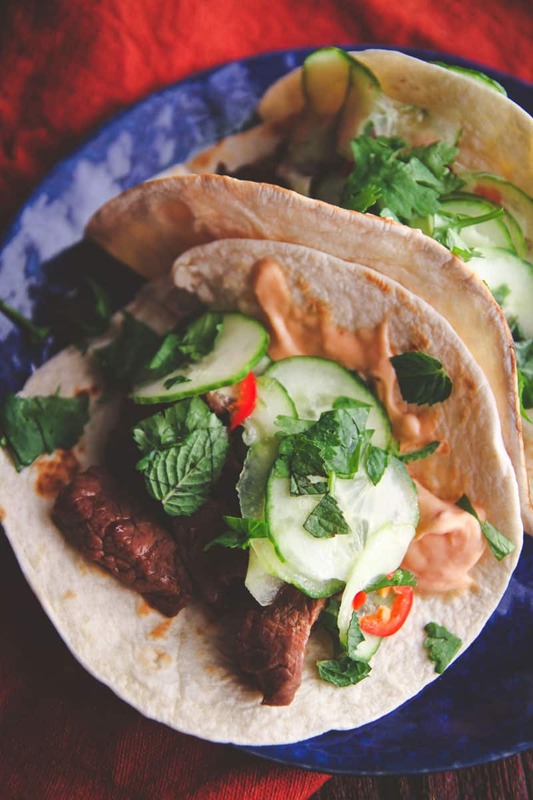 I had to share it and hope you enjoy these Korean BBQ beef tacos with quick pickled cucumbers. For the beef: finely slice beef. 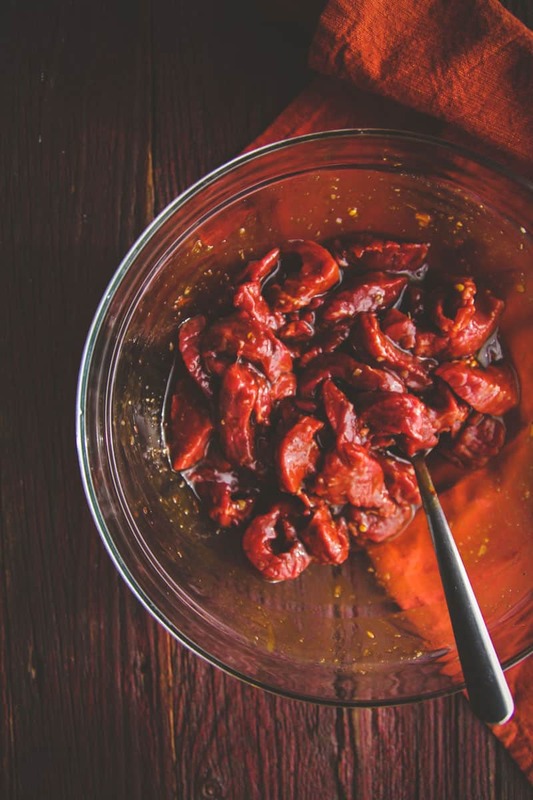 In a bowl combine all ingredients for the marinade and mix to combine, then add in the beef and let marinade for 30 minutes or covered in the fridge up to 24 hours. Tap off excess marinade and put beef slices in a large skillet over high heat. Cook for 6-8 minutes, stirring occasionally, until no more pink shows. 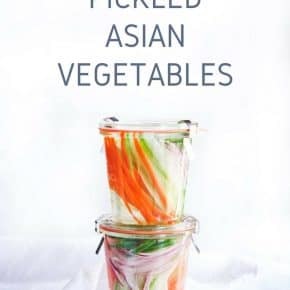 For the quick pickled cucumbers: slice cucumbers very thin (I use a mandolin) and put in a bowl, then add in rice wine vinegar, sugar, chopped jalapeno and pinch of salt, stir, and let sit in the fridge until ready to enjoy. For the spicy sauce: Mix all ingredients in a bowl and set in the refrigerator. If you like spicy-spicy, add more gochujang, this sauce as is is mild to medium. Warm the tortillas before serving. 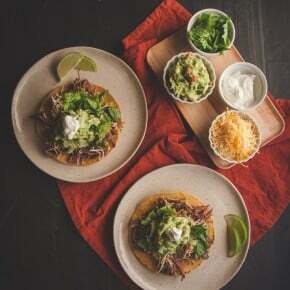 To assemble tacos, spread a spoonful of spicy mayo on one side of a taco, spoon a few pieces of meat into the tortilla, and spoon cucumbers into the tortillas and then sprinkle a pinch of fresh herbs on top and repeat until all tacos are assembled, then enjoy. Oohh this looks really good! I’ll be putting this on my menu for next week! Yay! I’d love to know what you think when you make them. Thank you so much for commenting! Thank you so much, these are some of the best tacos I’ve ever had! 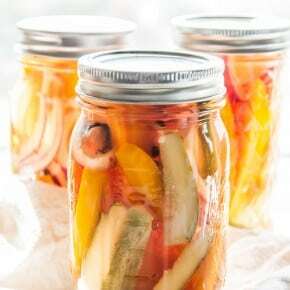 My kids would love these babies and I’m all over those quick pickled cucumbers! Cheers! Aw man…I gotta make room on my already-done meal plan for these babies. Quick pickles. Marinated beef. Spicy mayo. In a taco. SOLD! These will definitely show up in my weekly rotation, looks amazing. Thanks Phi! They’re definitely worth repeating over and over, i’m even making them next week too because they’re so good! Love how all this started with one lonely cucumber! This looks delicious, and I’m sure it would be a huge hit around here. 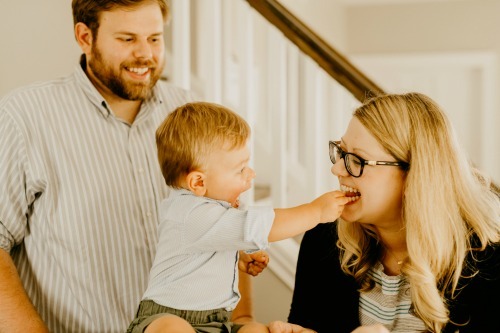 Thank you for always keeping your recipe so fresh and delicious ! I’m going to make these phi, they sound great. Can’t wait to hear what you think Rita, hope you love them! These were SOOOO good! Thank you for the awesome recipe. Even my 8 yr old girls loved them… without the pickled cuc of course. Wow! Will definitely make again and again! I tried this recipe out last night. I left the jalapeno out due to having a 10 year old who doesn’t like hot things but kept everything else in the recipe. I actually added shredded carrots in on top of the cucumbers. It was great. I have a local brewery here in Vermont that serves a very similar recipe and it tasted almost identical to theirs. I am definitely going to cook this again!! !